Once we entered Bolivia, I realized what he meant. The people were so friendly to all of us, and their hospitality was mind-blowing; I never would have imagined that the Bolivians would want to engage in detailed conversations with us all, whether it be about politics or music. They were just as curious about us as we were about them, which I also never expected. Even when we went to the rural community of Lupalaya, the people were interested in our culture, which is something else that I didn’t expect. It was so much more engaging than sitting there and being talked over to talk to our professors, which is what I was expecting more. Our travels have definitely left a positive impact on me. I never knew that the people of Bolivia could be so friendly, but they obviously proved me wrong. I now have a better understanding and a higher respect for their culture, something I hope to keep experiencing in the future. One day, I’ll come back, but for now, I’ll keep my Spanish lessons and my cultural observations close to my heart. 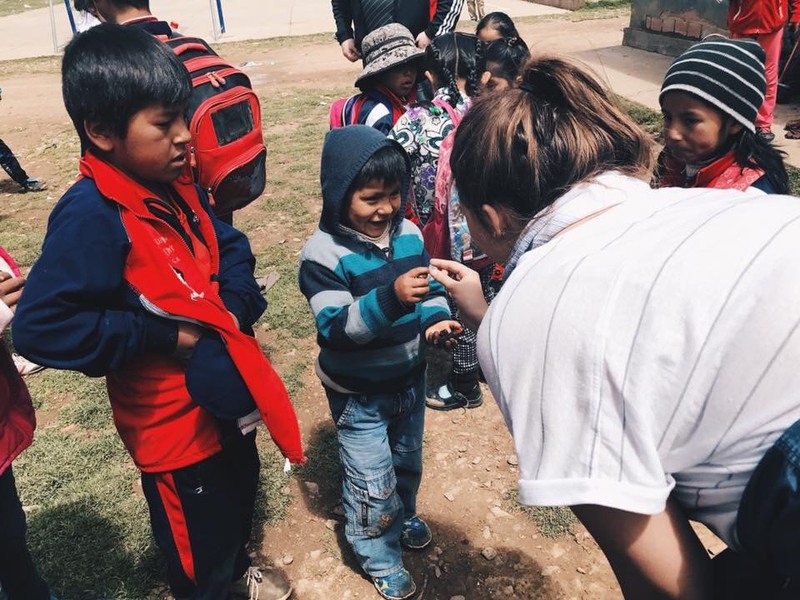 Bolivia was a great experience and I learned so much. Not only did I learn a lot about the language, but I learned a lot about Bolivian culture too. I think the biggest shock to me was how different the culture was from what I was expecting, like how open everyone was about talking about politics. Here in America and in all the other countries I have been to, I have never been bombarded with so many political conversations or questions. 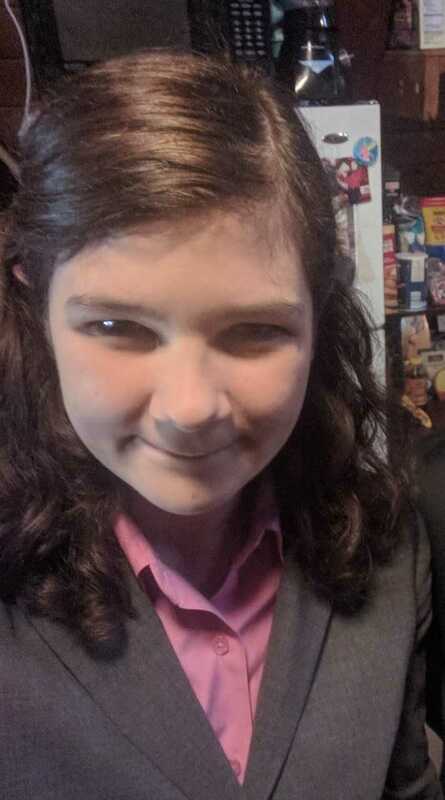 It was a bit overwhelming and I am not the most open to political conversations because I have some close friends that have opposite political views and it is normally just a topic we avoid. However, almost every single person we talked to brought up politics—not just Bolivian politics, but also American and Peruvian politics. In America, it’s rare to hear about politics in South and Latin American countries, so it was odd to hear how invested Bolivians were in American politics. Another way La Paz specifically was different from what I was expecting was its layout and how massive the city was. It was absolutely breathtaking and I was in such awe when we went on the gondolas over the city or when we went to the outer rim of the city. 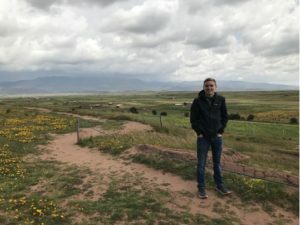 I got to see and experience so much while in Bolivia and I had a magnificent time learning more about the Spanish language and Bolivian culture. I would love to go back because there were some things I didn’t get to see that I would really love to see. I am someone who has always wanted to travel. I have been to many places within the United States, and I have traveled abroad in Canada and Italy. Bolivia was different from anywhere I’ve been. Bolivians are passionate people, and most of the ones I met were all very cheerful. And very friendly. I had the opportunity to talk with a lady on my return flight, who invited me to visit her hometown next time I was in Bolivia. And that’s how it was most of the time. We were Americans, and stood out from the crowd, but they didn’t care. We talked with them, and they welcomed us. 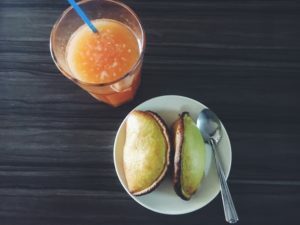 I think the most unique aspect of Bolivian culture (at least from an American standpoint) was how involved everyone was in politics—how much they wanted to discuss them at any given moment, but especially at meals. Even in the remote village of Lupalaya, politics were brought up over lunch. All of the graffiti was political as well. It changed my outlook on how I view politics here in the United States, and my idea on how involved the average person can and should be. 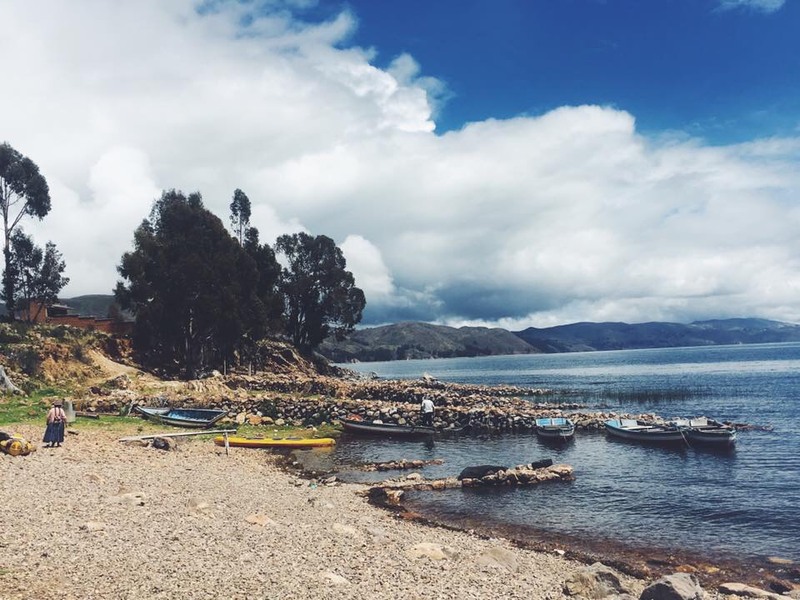 In January, I couldn’t tell you anything about Bolivia, let alone pinpoint it on the map. 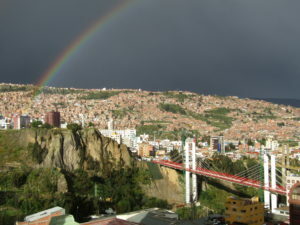 Now I feel innately connected to the people of Bolivia, and I believe that I will try to go back one day. Their culture is different from our own, but this isn’t bad. It’s new and exciting. I’ll always be glad that I visited Bolivia. Before traveling to La Paz, Bolivia I didn’t have any solid expectations. 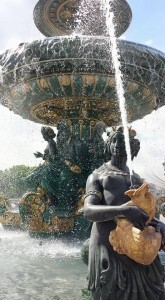 Having not traveled far or often I had no basis for expectation except what I had read in books and U.S news sources. Most of what I read was from the assigned book Bolivia in Focus or from the Internet. One thing I learned was how politically involved and informed the people were in and around La Paz. Everyone was informed about the political environment of their own country as well as about a lot of world politics. Most of the graffiti around the city was political and one of the most popular topics for conversation was politics. While I have never minded political discussions, it’s considered a difficult topic in the United States, and I rarely hear discussions about politics beyond the scope of our own country. This trip taught me a lot about the importance of informing myself about events that influence the whole world rather than focusing only on information about my own country. It also taught me about different perspectives. A lot of the information I’ve learned in school and from U.S news sources has a biased perspective. It was refreshing and informative to hear the same news and histories I’d heard in the United States from the perspective of another country. This trip showed me the educational value of travel and allowed me to practice navigating in a new environment. 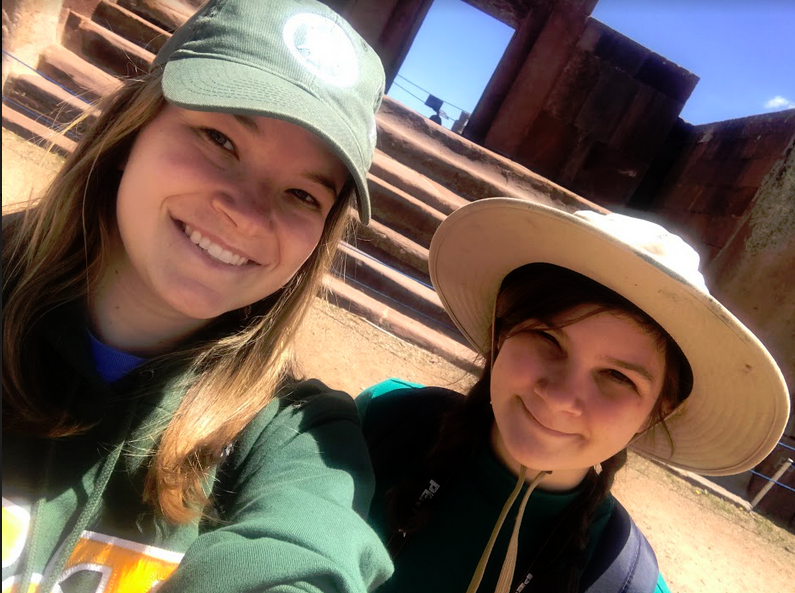 I was also able to practice speaking Spanish and learn about a few of the other languages of Bolivia that I had never heard before. This was a great first travel experience. It inspires me to continue looking for new experiences and to continue to travel in the future when possible. Jordan Pryor: Our final day in Bolivia was spent at ruins close to Lake Titicaca called Tiwanaku. 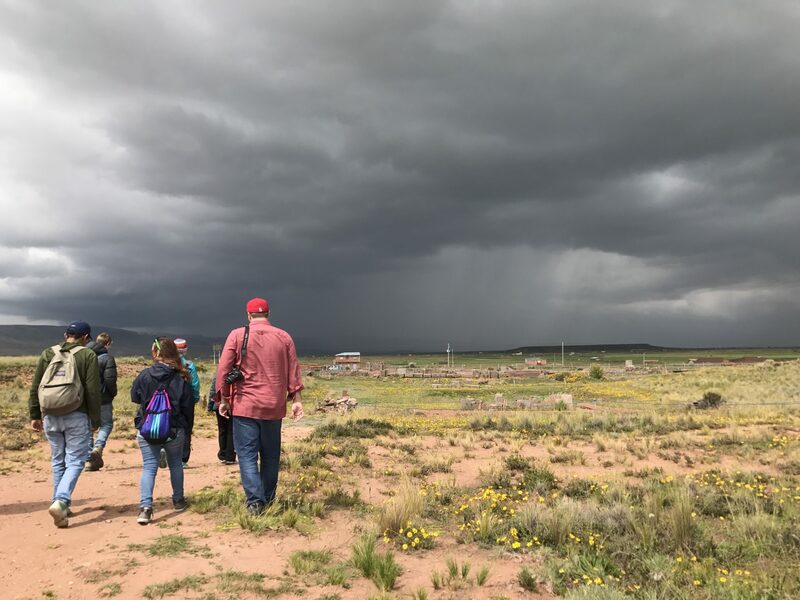 I enjoyed getting to be outside to experience the different climate while also getting to see and hear about the culture of the ancient Tiwanaku people. After Tiwanaku, we traveled back to La Paz and again visited the Witches’ Market. Some of us had some last-minute presents to search for, but we also all wanted to test out our Spanish on the “witches” again. I was so scared at first to make mistakes with the language or not be able to understand the women, but after a little practice it was way more fun than I expected. They really are very helpful and try to help you understand them while also being very understanding. I mean why wouldn’t they be if someone like me is willing to buy eight pairs of alpaca socks? Later, we strayed a bit from Bolivian culture and ate at a Swiss fondue restaurant for our last meal in Bolivia. I have absolutely no regrets though, because the food was amazing! Finally, we ended the night a bit earlier than usual, because of the impending early flight, with gelato. Anna Meyer: We woke up really early for our day trip. At breakfast, I gave a presentation about Tiwanaku. We were taken there by bus, and the bus was pretty cool. It was much more comfortable than the land cruiser. I got to have my own seat, which has been quite the luxury during the trip. The trip lasted about an hour and a half. We drove through the same town as the day before, El Alto. One can easily see the difference in social class from La Paz to El Alto. La Paz seems to be a much nicer area, and El Alto has much more visible poverty. The Tiwanaku tour was given in both Spanish and English by our guide. It was fun for me to try to understand the Spanish translations, but I also had the English translations to rely on. The tour was both outdoors and indoors. We saw some of the original ruins, but most were reconstructed to some degree by archaeologists. My favorite part of the tour was seeing all of the faces in the Semi-Subterranean Temple. Some of the faces look alien, which has caused many speculations over the years. We also went inside to look at other statues in the museums. These were much more impressive, but I wish that the ruins could be outside where they were originally found. 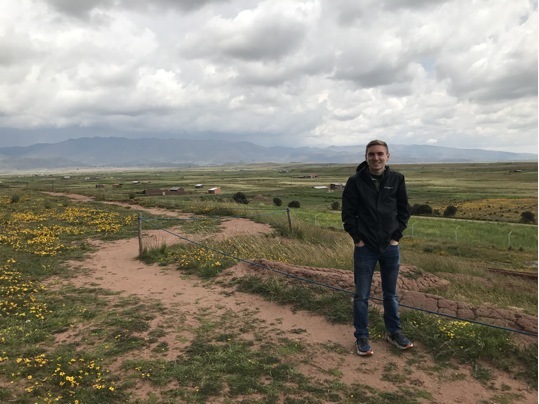 Connor Yarnall: The people who had once lived at Tiwanaku were deeply intertwined with nature. Their gods were based on the sun, moon, mountains, and the lake. They created complex temples that utilized the sun to help them plan crop yields and create calendars. As I walked around the ruins, it was easy to imagine the people who were once there. You could get a sense of their daily life and understand why nature was so important to them. If you looked around you’d be greeted with breathtaking views of the mountains and altiplano. This trip to Tiwanaku was a great way to end the trip. For the entire trip we focused on the how the modern Bolivians interacted and lived, but after Tiwanaku we had a sense of where they came from. Lauren Reynolds: Today was incredible. 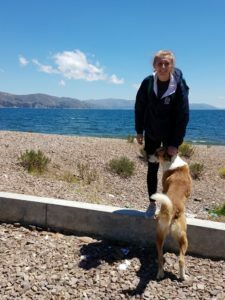 We met for breakfast at 7am and were on the road with by 8am to Lupalaya to see Lake Titicaca, scope out a possibility for a future water project, and visit the children at the orphanage there. The 3-hour drive was awesome because we got to go through La Paz, El Alto, and then more rural areas. The scenery in all three was completely different! Upon arriving at Lake Titicaca (the highest navigable lake in the world) we just stood by the water for minutes taking in the sight. The lake is a deep blue and looks as though it could go on for miles. Marco, who is a professor at UMSA, has a vacation house on the water and so he took some time to show us around. One thing I have learned while being in Bolivia is that the people are extremely hospitable. In Lupalaya there is also an orphanage. We all bought chocolates before going so that we could give them to the kids. They were skeptical of us at first but as soon as they saw the chocolate they loved us. They were fun to be around, but it was difficult to see how they lived. There were about 9 kids in each room and they live in such a high altitude that it is very common for the children to get skin cancer from the sun. I actually held a six-month-old who had skin cancer. Something that also got me thinking was the attitudes of the children. Sometimes it seems as though the problems in my life are so big when in reality I have it so good compared to many people around the world. The kids we saw were so happy, they make the most of what they have, and they have really kind hearts. It is such a humble reminder that I have so much and am in a position to give so much and without this experience I don’t know if I would have ever had that realization. Those children left a really big imprint in my heart and I really hope to in the future get to go back to Lupalaya and help with the water sanitation project and then hope to also help the orphanage with their other needs. Anna Meyer: Today I woke up early and ate with my group at the hotel. We left the hotel at 8 in the morning and piled into a land cruiser driven by Ricardo, from Engineers in Action. 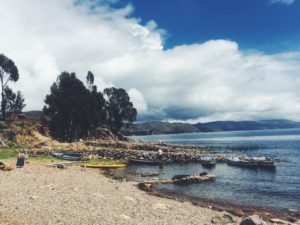 The destination was Lupalaya, another 1,000 feet up from La Paz near Lake Titicaca. 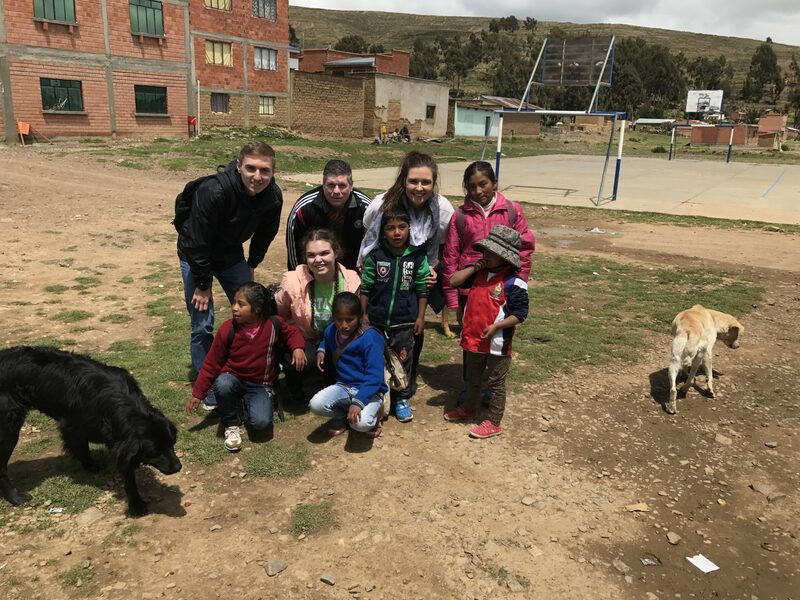 The village is rural and is occupied by a fairly small population, including many orphans from La Paz. We were in the land cruiser for 3 and a half hours. Many of us tried to sleep, but it was merely impossible due to the bad road conditions. We drove through El Alto, a much poorer region of Bolivia. Many of the roads on the way were severely beat up, and some were not paved at all. A normal car would not have made the trip. At the orphanage, our group gave candies to the kids. I saw the rooms that the children stay in. There were over 20 beds in each room. No privacy, no space. It makes me sad to think about how much less many people have than I do. I have never seen poverty that severe. The caretakers at the orphanage told us that a few days out of the week they sometimes go without water. There are rations in Lupalaya because there is not enough water for everyone there. That night we went to Martín’s house for dinner. His wife made us such a delicious meal. She made a lasagna with several different types of meat in it. It was a late night on account of us having such a great time. We talked a lot about the differences in education between Bolivia and the United States. 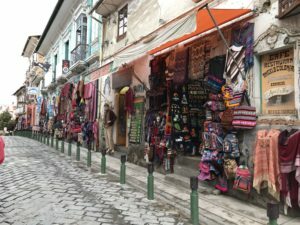 It is interesting that in Bolivia, college is free, or mostly free. I think about it a lot when thinking about the different ways governments spend money. I still wonder why the Bolivian government does not prioritize wastewater treatment, but it prioritizes education. This is something I will be looking into more as I write my research paper. 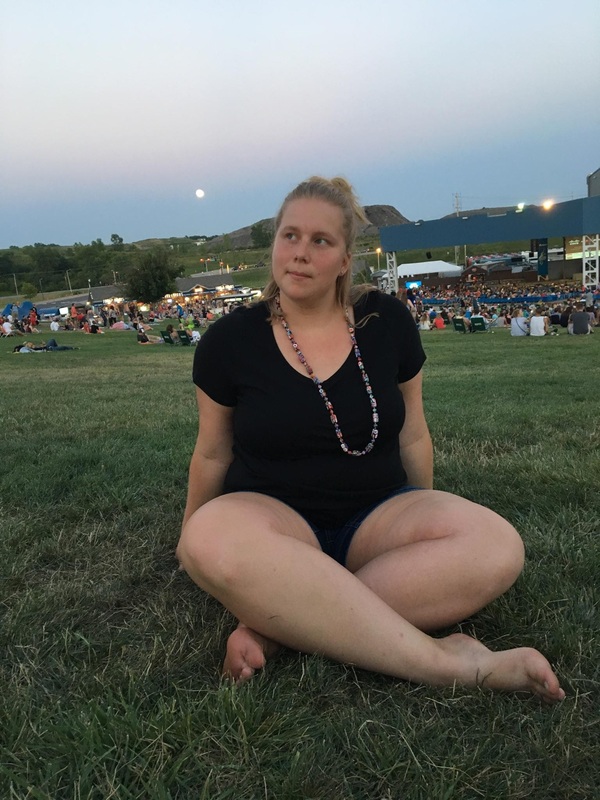 Lauren Reynolds: Today was the last day of classes! It was really fun because we did 3 hours of tutoring and then got to end an hour early to play a Spanish game and eat salteñas! I was absolutely terrible at the game but it was fun to get to use some of the new Spanish vocabulary that we had developed over the last few days. 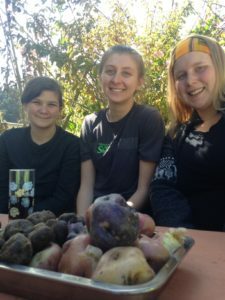 It was bittersweet because our professors were awesome, but it will be nice to have the last two days in Bolivia devoted to all cultural experiences. There were some moments today that really opened my eyes to how much I take for granted in the States. I take for granted things like getting to have a bed to sleep in every night, always having clean drinking water, and the privilege of going to school. A conversation with a friend about the poverty in Bolivia got us thinking about how we truly didn’t realize how many people did not have homes to go to after a long day of trying to make some money. Also, the issue of clean drinking water is huge. I have been getting used to drinking only bottled water, but if this was going to be a forever thing of not being able to brush my teeth with tap water or simple things like that, I would get really frustrated. 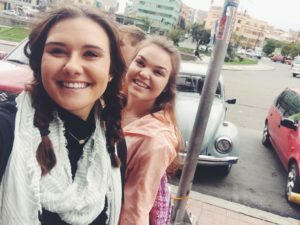 Jordan Pryor: Finally, we went to the place I had been looking forward to, El Mercado de las brujas! Also known as the Witches’ Market, this section of streets is filled with all sorts of things to buy, from dead, dried animals (for traditional practices) to keychains and jewelry. It was a bit overwhelming at first, but once I got going and started to buy things I realized that the “witches” like you to bargain! 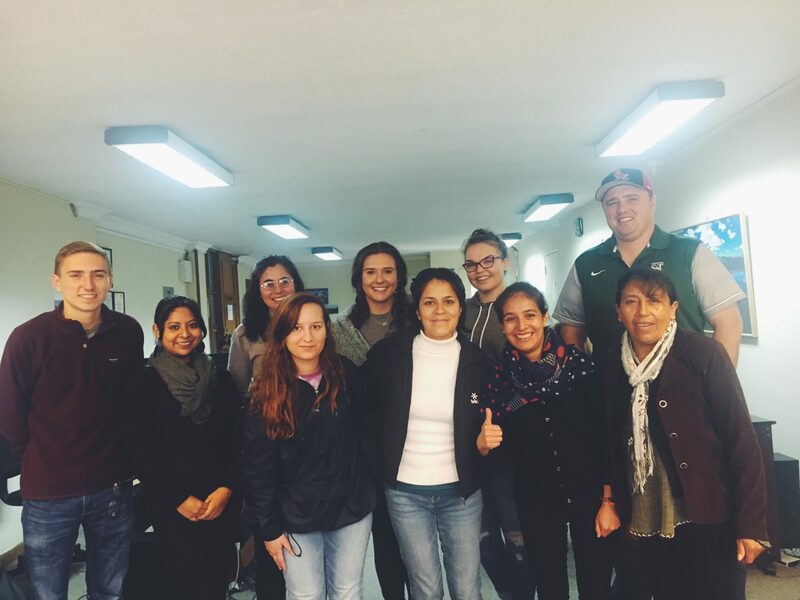 It was fun to know that our Spanish classes were actually paying off, and I think the experience was way more interesting being able to understand and talk with the vendors. Our favorite type of product was anything made from alpaca or llama. Seriously, you won’t think that you’ll want alpaca socks until you feel them, and then you’ll KNOW that you need them. The whole experience gave me a new confidence speaking Spanish. I think that the fear of messing up is what holds a lot of people back in language learning, because this is one of my biggest issues too. The trip to the Witches’ Market also gives a good taste of the culture, specifically that of the indigenous people. If you look further into the shops than just the exterior, you can get a glimpse of what it may be like to be an indigenous woman in Bolivia, which, for me, was a very humbling experience. Connor Yarnall: Today was a day filled with history. We traveled to three museums: Museo de Historia Natural, Museo de Metales Precios, and Casa de Murillo. The first explained crucial events that led to the creation of Bolivia. The second had Bolivian artifacts made of gold, silver, and bronze from various time periods. It showed the importance of mining in Bolivia’s history. The last one was a tour of the house of Murillo. Murillo was a patriot of Bolivia and fought against Spanish rule and advocated for Bolivia’s independence. After the museums we went to La Iglesia de San Francisco and El Mercado de las brujas. I had created a short presentation that I gave to the group about the church and was very excited doing my research on it beforehand. The church was beautiful, with great gold decorations and beautiful carved stones. After the visit I was able to buy some merchandise for my friends back home in the Witches’ Market. This was another example of being able to use my language skills to communicate with the vendors. Shopping in the market was a great time and I was confident to use my abilities. 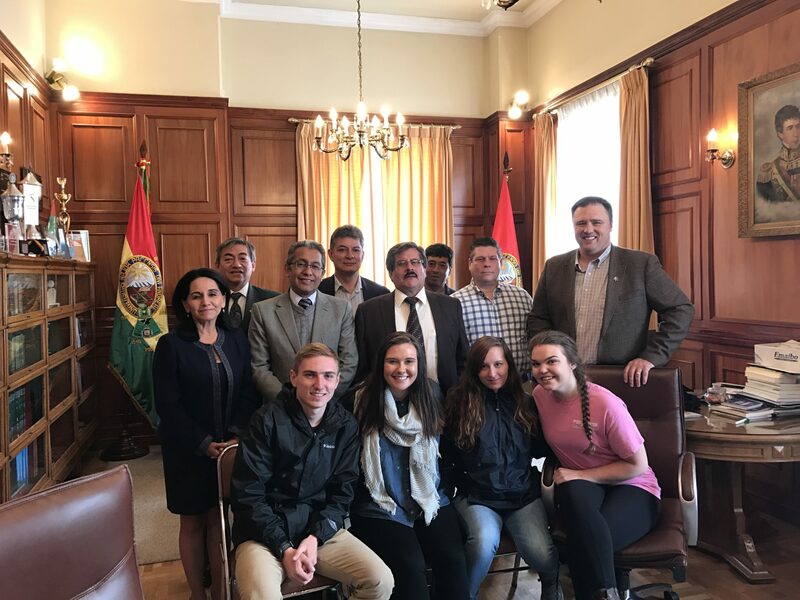 Connor Yarnall: My day began with another Spanish lesson; however, we had to cut this one short for a meeting with the chancellor of UMSA. UMSA is a large university in La Paz with eighty thousand students. We went to one of their many campus buildings that hosted the offices of many administrators. The meeting with the chancellor went very well and he was very hospitable. He even came with us to lunch. Afterwards, I decided to do some shopping and was able to find some good items for my friends back home. But that only lasted a little while as we had another meeting with EIA (Engineers in Action). I was really impressed with the work conducted by EIA, a non-profit organization. They care for many rural communities surrounding La Paz and had more communities to care for then they could supply. It really opened my eyes about what type of work was needed and the problems Bolivia has with their water, infrastructure, and energy. Lauren Reynolds: In the afternoon, Connor and I visited the Witches’ Market. We were supposed to be back at the hotel by 6:00. We departed from the witch’s market with 20 minutes until 6:00 thinking that would be plenty of time to get back to the hotel and it would have been if we had not run into the traffic zebras! Bolivia uses traffic zebras to help pedestrians be able to cross the streets safely. 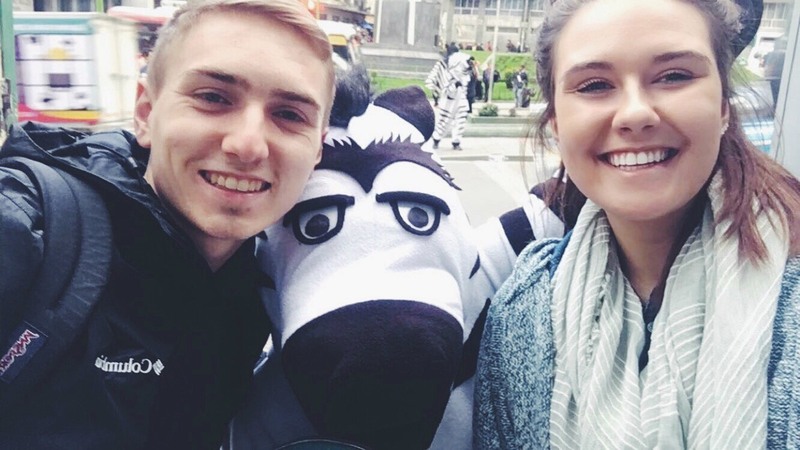 We couldn’t continue heading back without a selfie with a zebra! 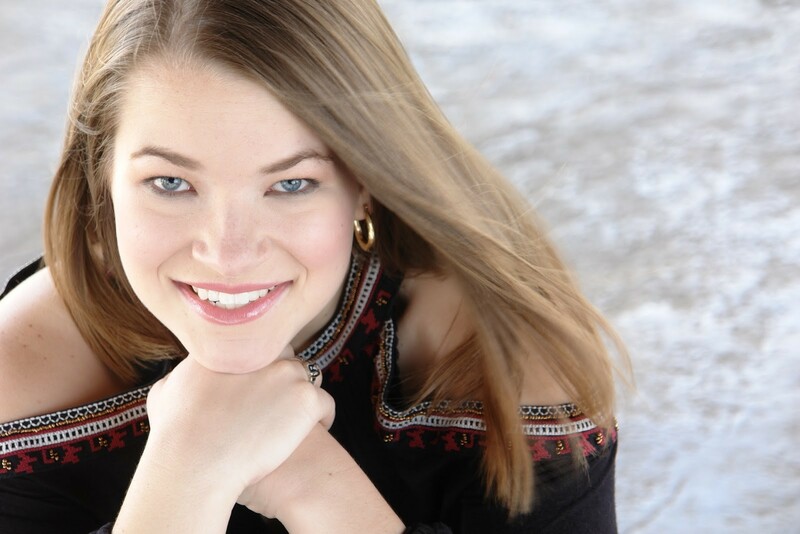 Anna Meyer: We got back to the hotel and I scrambled to get some homework done. Shortly after returning to the hotel, we left again for the movies. We got there by taxi and teleférico. I was surprised by how easy it was to understand the film despite it being in Spanish. I enjoyed the movie very much, but it was not a happy movie. It was extremely suspenseful. Going to the movies in Bolivia was an interesting experience because I saw a lot of teenagers there. I have not seen that many in the city. I liked seeing the couples all dressed up for their dates. 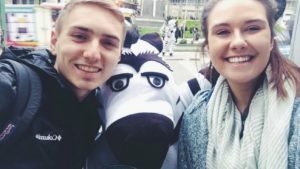 Jordan Pryor: While the rest of the group went to experience a movie in Spanish, Lauren and I decided to explore the mall. Malls here are quite different from malls in the United States. They are way busier through all hours. For example, as the mall came closer and closer to closing time, the human traffic did not seem to decrease at all. 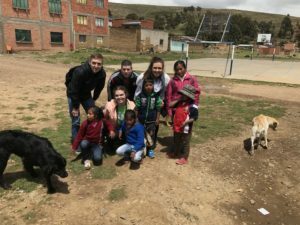 I believe that this is a great example of how different people are socially here in Bolivia and really Latin America as a whole. They are, in general, more social all of the time rather than just on the weekends. You will find that in most Latin American countries, there will be people out and about way later than you will find in the United States. This is especially noticeable during weeknights, and we often found ourselves saying, “Don’t they have work tomorrow? !” It is quite interesting how differently people interact with each other according to the country that they are from. Lauren Reynolds: Today was a beautiful day because I got to pick what we ate and that was salteñas! I love salteñas. 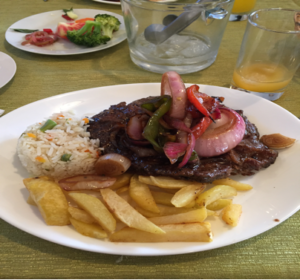 If you’re reading this, you probably read my introduction, which mentioned that I had been to Bolivia before, so knowing how wonderful this Bolivian dish is I could not bear to not have it on this trip. They did not disappoint. After lunch we went back to the hotel and waited in the lobby because the Bolivian national fútbol team was staying in our hotel! They were playing against Argentina. Latin America has the coolest fútbol atmosphere. Fans crowd around the doors of the hotel to get pictures of the team getting on the bus, and those that can get into the hotel race to get pictures with their favorite players before they have to leave for the game. We then embarked on the longest walk ever to the stadium in the rain. The altitude is around 12,000 ft above sea level in La Paz (the altitude in Denver, CO is under 6,000 ft), which makes it very difficult to breathe when trying to walk anywhere. Once we got near the stadium there were people lining the streets selling Bolivian and Argentinian gear. Of course, I had to get a scarf! Something I thought was interesting was that since it was raining, there were people outside the stadium selling pieces of styrofoam for you to sit on to. The game was amazing! What a totally different atmosphere than any professional sporting event I have been to in the States. Connor Yarnall: Thousands of people were surrounding the stadium. It was a Bolivian tailgate with people cooking, banging on drums, and selling merchandise. I was able to talk to a native woman and buy myself a Bolivian flag. I was feeling the excitement to root on the home crowd. As we approached the stadium, the Argentinian team bus pulled up, receiving loud applause from the Argentinians. But I told myself I was on Bolivia’s side today; as a guest in this country I have been treated great. The game was electric. Bolivia was able to take the win 2-0, which made being in the crowd even better. 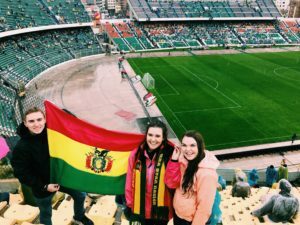 I felt like a Bolivian, joining in on the crowd chants, applauding the goals, and sitting in the packed stadium. It was truly an experience I’ll never forget. En Route to La Paz! 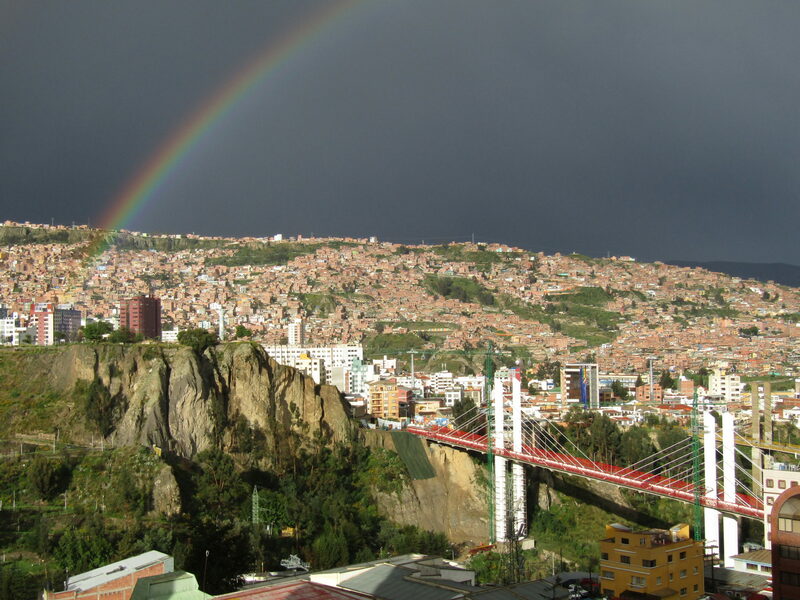 Today is the day I travel to La Paz, Bolivia. I have never been to La Paz and I am extremely excited to learn about the people and their way of life. I hope to find a culture that is unpredictable and completely different than my own. 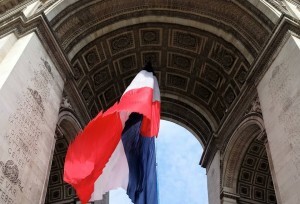 I am like any other traveler who wants to experience the atmosphere of a city with its architecture, food, and history. However, what I expect most out of this trip is communication. I have studied Spanish too long, even though I loved every minute, to not have a better grasp on speaking the language. I hope to share my thoughts, opinions, and background with the Bolivians in Spanish and receive from them the same. 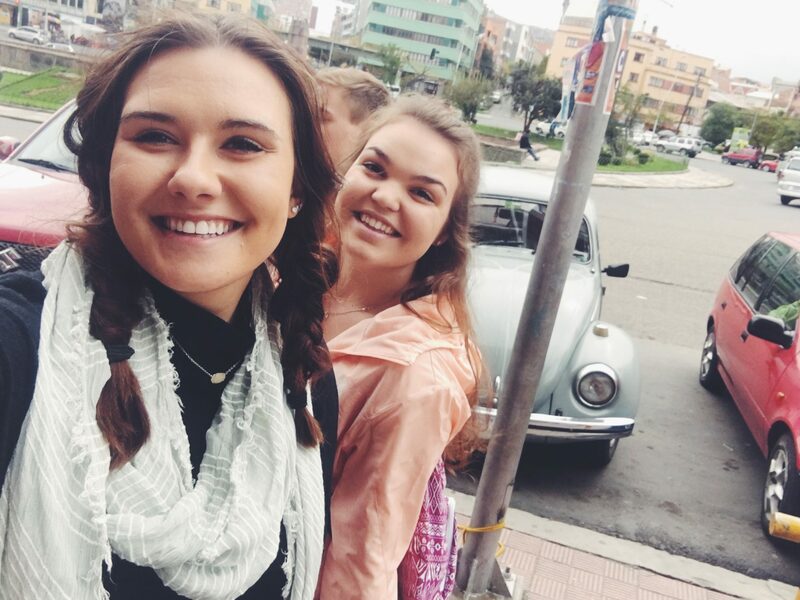 I hope to find a sense of accomplishment in my study of Spanish during my stay in Bolivia for being fluent in another language as always been a dream of mine. The thick fog made it seem as if we had landed in the pitch black at about 4:30 in the morning. 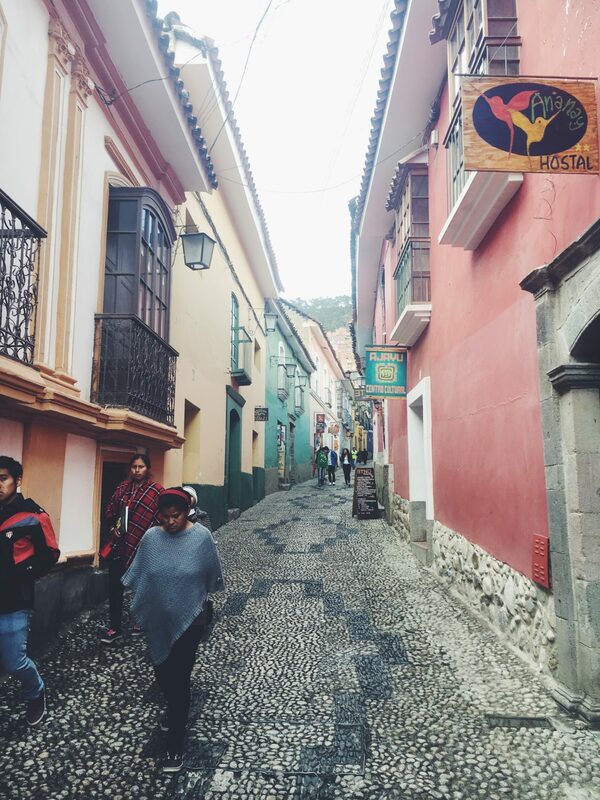 Immediately, the city of La Paz was a culture shock. I felt as if I knew what to expect when I got here, but no extent of research can really compare to experiencing something in real life. One of my favorite parts of traveling is the flight itself. I love airports and the cramped cabins and all the different people that flying introduces you to. On Saturday, the group and I flew out of St. Louis in the afternoon and landed in Miami. Next, we got on our final plane to La Paz, Bolivia! It wasn’t a full flight and we spent the first twenty minutes trying to find window seats to move to (with no luck). The plane ride to Bolivia was a cultural experience, as most of the people on the flight were from Bolivia. Upon descending into La Paz our plane was struck by lightening, which was the scariest but coolest part of the flight. Landing in La Paz at 4:30 a.m. was quite the adventure. Not to brag, but I was the only one who filled out my forms correctly. Going through customs was way quicker than I expected and before I knew it we were on the way to the hotel. Once we got there we had the luxury of having a few hours of sleep. We woke up at 12 p.m. to meet for lunch with a professor in Bolivia and his family and they were very welcoming and invited us to their house after our meal. The first day, I had some altitude sickness but I was able to get that under control by drinking a lot of water and some coca tea. I think we all spent the first day groggy and under the weather, so we called it a night rather early. I arrived in Bolivia around four in the morning. 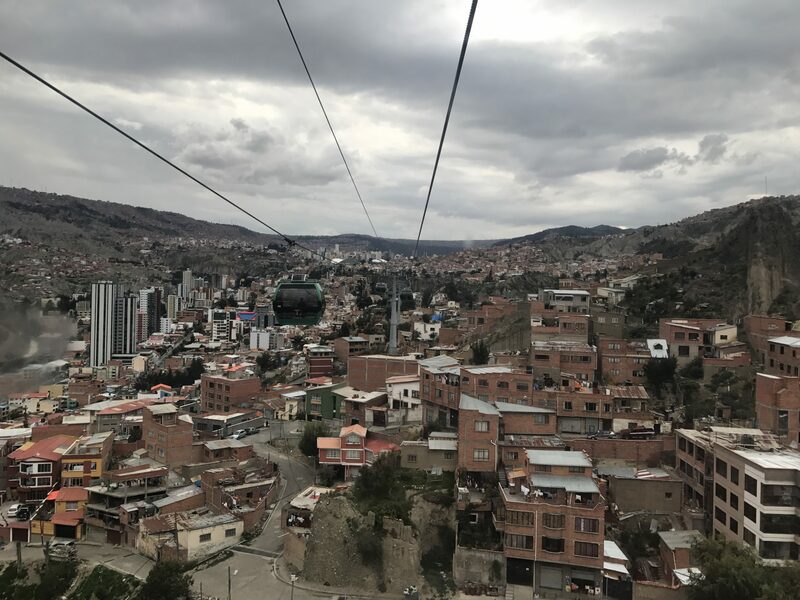 I was in a hazy state and I could not remember much of the taxi ride through the town of El Alto but I could remember the mountainous terrain. As the ride continued toward my hotel, I became aware of the ever-changing elevation from street to street. From this simple taxi ride, I started to gain an appreciation for how the landscape had shaped the lives of these people. I woke up in my hotel hours later around lunchtime. The highlight of this day was talking in Spanish to the wife of a UMSA (Universidad Mayor of San Andrès) professor. She did not speak English and was gracious in slowing down her speech and complexity of language to interact with me. As we continued to talk over lunch, I became more confident in my ability and was accomplishing the goal I set for myself. She gave me a good introduction to Bolivia and I could feel the friendliness of the people around me.